Keep important documents on hand and show off your favorite books and accent pieces in your home office with the addition of this traditional style file bookcase. The base of the bookcase features a drawer that can accommodate either letter or legal sized hanging files while the upper portion consists of three adjustable or removable shelves so you can ensure the bookcases storage function matches your storage needs. The Eastchester Traditional File Bookcase with Adjustable Shelves by Flexsteel Wynwood Collection at Olinde's Furniture in the Baton Rouge and Lafayette, Louisiana area. Product availability may vary. Contact us for the most current availability on this product. Storage One file drawer and three adjustable or removable shelves. Construction: Case Each piece is constructed of Poplar solids and Cherry veneers. Add a sophisticated feel to your home office or bedroom when you bring home a piece from this collection. 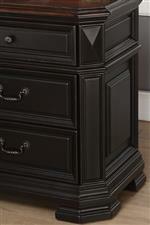 Each piece is finished in a beautiful dark brown and black and features layered moldings at the base. 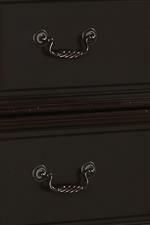 The finish is accented perfectly by framed drawer fronts on storage pieces that feature twisted metal drawer drop pulls. Every piece in this collection features elegant architecture from top to bottom to bring a traditional style with modern conveniences to your home. The Eastchester collection is a great option if you are looking for Traditional furniture in the Baton Rouge and Lafayette, Louisiana area. Browse other items in the Eastchester collection from Olinde's Furniture in the Baton Rouge and Lafayette, Louisiana area.